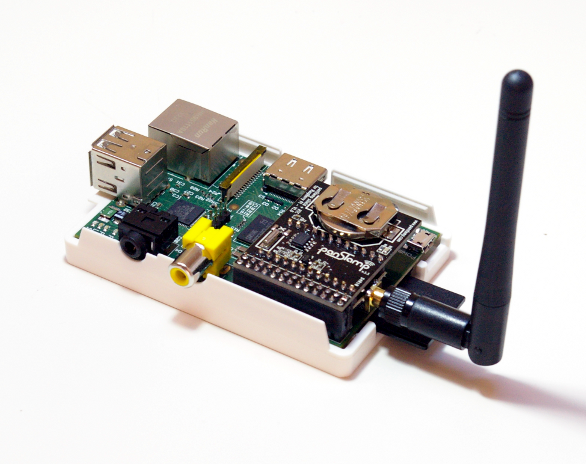 Our shield for RaspberryPI is the most elegant way to add low-power wireless connectivity to the most popular compact computer in the world. Featuring a panStamp, this shield releases the computer from having to deal with the low-power wireless communications. Instead, the on-board panStamp acts as a modem connected to the RPI UART (serial port). This shield also includes a real time IC with battery backup so that we no longer depend on remote NTP servers and Internet connections to get the current time, even after an outage. panStamp managing all the low-power wireless communications on the free 868/915MHz ISM bands. DS1338 IC for the RTC function with battery (CR2032) backup. Enabling the RTC function also implies doing some changes on Linux. There are many tutorials about this in the net but this is our preferred one. Raspbian has the I2C interface blacklisted. Before running through the above guide, be sure you enable I2C. To do this, edit the file '/etc/modprobe.d/raspi-blacklist.conf' and comment out the line 'blacklist i2c-bcm2708'.